Venture into the magical and mysterious lands along the Norwegian coast, for close encounters with glaciers and impressive fjordscapes. This In-depth voyage will take you to important sites of Norway's ancient history and UNESCO-protected heritage sites, whilst enjoying some of the most incredible nature you'll ever see. 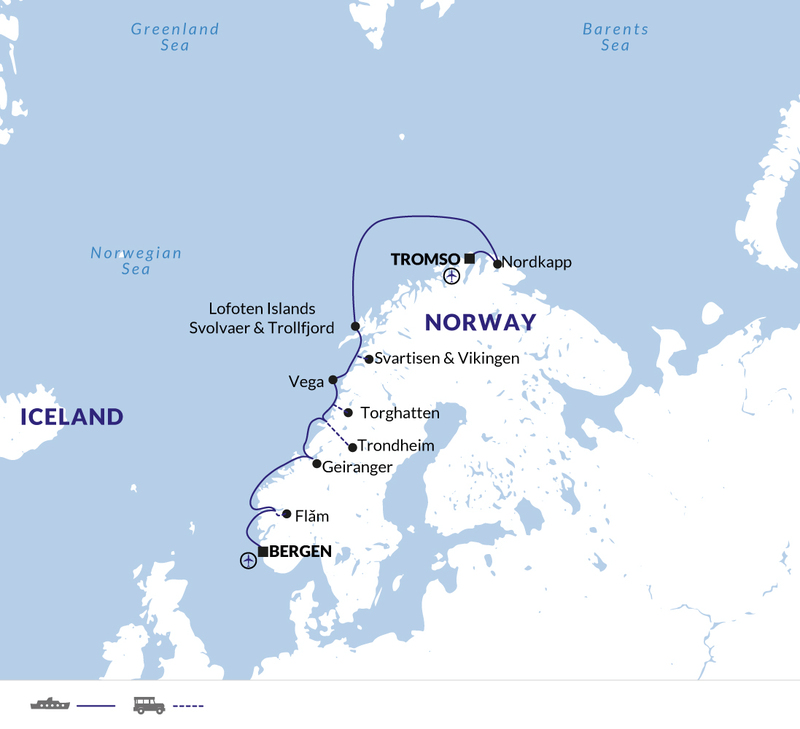 Welcome to Tromso, the capital of northern Norway, known as the Gateway to the Arctic. Embark the Expedition in the evening, this is the start of your week-long adventure exploring the delightful Norwegian fjords. Rugged landscapes and remote inlets await and there will be plenty of time to explore this area of outstanding beauty, both on land and by Zodiac. Explore one of the most northern points in Europe. A popular spot to watch the midnight sun during the summer months, as the sun never sets between the middle of May to late August, this cape is the location where the Atlantic and Arctic oceans meet. Explore the barren landscape, quaint fishing villages, and stop by the Northern Cape Plateau standing 307 m above sea level. Spend the early morning at the short, yet dramatic Trollfjord. Search the cliffs on your continuing quest to spot trolls, the mythical creatures of Norwegian legend. Head ashore on Svolvaer to explore some of the highlights of the Lofoten Islands by coach, including Nusfjord, one of Norway's oldest and best-preserved fishing villages. The Lofoten archipelago is an enchanting area of picturesque villages, backed with jagged peaks which are perched by the sea. Enjoy lunch in a local restaurant, before ending our visit in the village of Å. Visit Svartisen, Sanna and Vikingen, for beautiful glaciers and a globe sculpture which marks Vikingen as a point directly on the Arctic Circle. Svartisen is Norway's second largest glacier and water collected here is used for hydropower. Here, we hope to enjoy a scenic walk up to a glacier, before continuing onto Vikingen. We will also make a stop en-route in Sanna, offering more walking opportunities as well as a chance of spotting sea eagles. A UNESCO World Heritage site, Vega is known for its picturesque fishing villages and history of eider down harvesting. Enjoy some opportunities to explore the area on foot or with an optional guided tour. The rugged coastline of central Norway features some of the world's most beautiful scenery. The captain will negotiate with local Norwegian pilots to determine our best Zodiac landing options. The mountain scenery and coastline offer breathtaking views. The goal is to visit Torghatten, one of the most bizarre rock formations in Norway and a significant local landmark. We will hopefully be offered the chance to sail towards the Træna archipelago, which is made up of over a thousand islands. We continue on to Trondheim, a modern city surrounded by beautiful forests and mountains and is home to the remarkable Nidaros Cathedral. Built over the burial site of Saint Olav, the King of Norway in the 11th century, Nidaros Cathedral is the traditional location for the consecration of the King of Norway. Choose between taking an afternoon hike to the Sverresborg Folk Museum, or enjoy a city tour including the Folk Museum and the elaborate Cathedral, built between 1070 and 1300. We sail deep into one of Norway's most beautiful and most visited fjords, Geirangerfjord. The fjord is 15 kilometres long, surrounded by spectacular mountains, lush green trees, waterfalls and several farms. This popular tourist site has been listed as a UNESCO World Heritage site. Ensure that you have your camera to hand for some spectacular photo opportunities as we soak up the views at this UNESCO-protected site. Disembark the Expedition in the morning after breakfast. Seasonal Climate Despite the northern latitudes the climate in Norway is not extreme, due to the affects of the North Atlantic Drift. Between May and September is the best time to visit this region, with summer temperatures reaching the high teens and rain a regular feature year round along the coast. North of the Arctic Circle the sun does not set between the middle of May and the end of July, so you can expect to encounter the midnight sun during this period. This will be provided by the ship operator. Please register your size with us before travel and we will arrange for your parka to be available in your cabin on arrival. Water-resistant trousers of coated nylon or, even better Gore-Tex®, are essential for your comfort. They can be worn over your regular clothes to keep you warm and dry. We suggest that you purchase trousers a few sizes larger than you normally wear as you will be wearing them over other clothing. Gore-Tex® or similar fabrics are excellent for keeping out wind and water without trapping excess heat. In addition to your waterproof trousers, warm ski pants are suggested if you have them. Warm trousers such as jeans, corduroys etc. are also good. Woollen, knit or cotton jumpers/tops, polar fleece tops (medium weight), several cotton turtlenecks and T-shirts for layering on and off the ship. These are rubber, waterproof boots that are just below your knees with a strong, ridged non-skid sole. You usually have to step from the Zodiac into icy water up to 30 cm high on most landings. Do not bring heavy, cumbersome boots that make it difficult to walk or boots with metal cleats, as they cannot be used for landings. For maximum warmth, wear loose-fitting boots and two pairs of socks. Try out your boots before the voyage. Tipping is of considerable significance to the people who will take care of you during your travels. It is an expression of satisfaction. The suggested amount is USD $10 - 15 per person per day spent on board. Of course, tipping is a personal choice and the suggested amount is set only as a guideline. The money is collected by the Hotel Manager at the end of the voyage and distributed among the crew and Expedition Staff. The Officers choose not to participate in the tipping pool. Recommend you buy some Norwegian Krona before departing the UK (or whist in transit in Oslo). ATMs are available in Myre and at Oslo and Evenes Airports. Credit cards are generally accepted at many hotels and optional excursions may be paid for by credit card. The lead-in prices on our website are based on outward facing, category one cabins on the lower deck. Category one cabins are triple or quad share. They are comfortable with a private toilet and shower, and porthole. The Expedition has a number of different cabin categories, ranging from quads, twins and suites - all are outside facing, with two beds (apart from the suites which have queen size beds). Some cabins have larger windows, depending on your cabin grade. We can also offer single occupancy at a supplement which will be subject to availability at the time of booking. A full layout of the deck plan can be found under the Polar Ships section on our website. Your confirmed cabin type will appear on your Booking Confirmation which will be sent on receipt of your deposit payment. Onboard our expedition ship you'll find a diversity of gourmet international cuisines prepared and catered by professional chefs; all meals are included in the price of your expedition. Dining is casual, tables are unassigned and the dining room is capable of seating the entire passenger compliment at one time. There is always a selection of different meals available, and vegetarians will find plenty of options. Special dietary requirements can be accommodated with advance notice; please advise us at time of confirmation. Coffee, tea and water are all provided free of charge. All other beverages, alcoholic and non-alcoholic, are not included and can be purchased in the dining room, pub or in the lounge. Please check the latest requirements with your travel clinic or doctor prior to departure. The above is not an exhaustive list. Further information regarding vaccinations and travel health advice can be found by following the NHS and NaTHNaC links at Explore Travel Health and from your local healthcare provider. Visa and vaccination requirements are subject to change and should be confirmed by you before travelling. Information After disembarkation, you will be transferred to either the airport or the Radisson Blu Hotel, depending on the time of your flight. Those transferred to the hotel will have an opportunity to explore the town centre on their own and then be transferred to the airport later in the day, as per flight schedules. Transfer times will be confirmed and communicated onboard prior to departure. Luggage storage at the hotel will be available until your time of departure. Please note, hotels are subject to change and the exact hotel will be confirmed within your final documents.